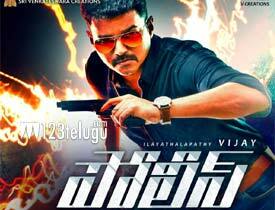 Tamil superstar, Vijay’s Theri has been dubbed into Telugu as Police. Directed by Atlee, this film which also stars Amy Jackson and Samantha as the female leads has hit the screens today. Let’s see how it is. Joseph Kuruvilla(Vijay) leads a simple life along with his six year old daughter in Kerala. There, he comes across a school teacher Annie(Amy Jackson) and starts getting close to her. As time passes by, Joseph gets into a feud with some local goons and bashes them up big time. Surprised by Joseph’s aggression, Annie starts researching about Joseph and finds out a shocking truth that he was a daring ex-police officer called Vijay Kumar. Who is this Vijay Kumar ? Why did he settle down in Kerala ? What is his past ? and where does Samantha feature in this entire set up ? To know answers to these questions, you need to watch the film on the big screen. Undoubtedly, Vijay is the major highlight of the film. Probably for the first time, he has done a slightly mature character and has impressed big time. The way Vijay has showcased various emotions in his role with different shades is just awesome. Especially his look as the gritty cop and all his confrontational scenes with the villain are pretty good. Samantha is yet another bonus to this film. Her role is tailor made as she brings a warmth and depth into the proceedings through her lovable performance. Interval bang is the highlight and has been executed in a thumping way. Famous film director Mahendran plays the main villain and is superb in his character. First half of the film is pretty decent as all the aspects such as romance, emotions and mass elements have been showcased nicely. One of the biggest drawbacks of the film is the predictability. Right from the first frame, you exactly know what is going to happen next. There are no major twists or turns that will keep you excited. Amy Jackson looks out of place and her weird hairdo does not help matters much. Yet another drawback is that the film does not have a proper flow. Even though the director narrates all these elements in a decent way, he gets carried away and keeps side tracking the film. Music of the film is hugely disappointing as none of the songs manage to register. Background score by G V Prakash is superb and elevates the film in right areas. Screenplay is average as major scenes could have been set crisply into the narration. Production values are superb as the film looks rich in texture and the thumping camera work supports the visuals supremely well. Coming to the director Atlee, he has once again dealt with the various emotions decently. The way he has handled a huge star like Vijay and showcased him is very impressive. Had he added a few more thrilling elements and cut down on the run time and unnecessary scenes the effect would have been even better. Even though Police is a hugely predictable film from the word go, elements like Vijay’s performance, Samantha’s lovable character and some commercial thrills will keep you interested in the proceedings. Vijay’s fans would have loved his role in Tamil but for the Telugu audience, this film is just a passable masala entertainer.